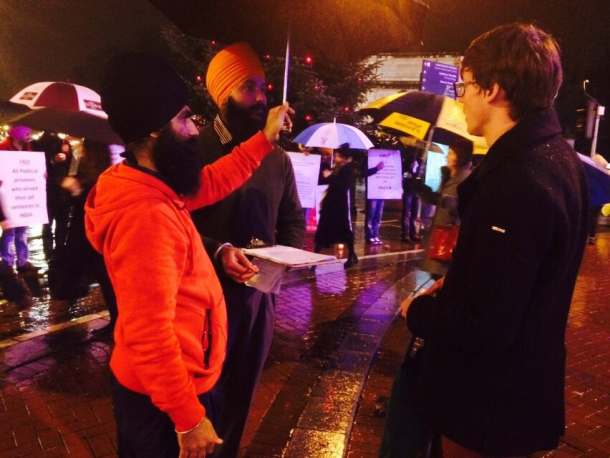 DUBLIN, Ireland (December 21, 2014)—Yesterday evening, Sikhs of Dublin (Ireland) organised an awareness/ support rally in Dublin City Centre in support of Gurbaksh Singh. 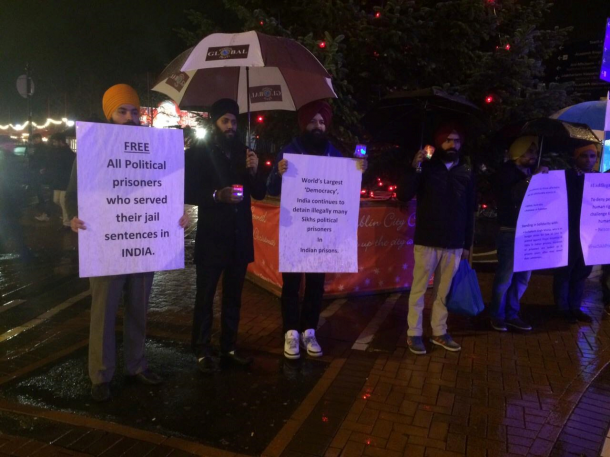 It is worth mentioning that Gurbaksh Singh is sitting on a hunger strike in India since 14th December, 2014 to seek the release of those prisoners who have completed their prison sentences yet remain behind bars in India. There are prisoners who should have been released 10 years ago, but are still locked up by authorities in India. Last year when Gurbaksh Singh entered 41 days of his hunger strike, the state and central government assured through authorities of Akal Takht Sahib (seat of Sikh temporal authority) that the government will set free those prisoners who had served their sentences. However, none of the prisoners were released. As a result, Gurbaksh Singh has to sit on a hunger strike again, and today marks the 34th day of his hunger strike. Members felt strongly about this issue and stood in the rain raising awareness about the issue. There were a lot of people who came forward to sign the petitions to be submitted to Irish foreign office and Indian Ambassador in Dublin. After learning about the issue, people willingly came forward to sign and support the cause. Hopefully, Sikh communities around the world will do their bit to support Gurbaksh Singh and his fight for a humanitarian cause.